Hello! Happy Friday and I hope you will enjoy the third day of the Issie top pattern tour!! Until the end of the tour you can receive 10% off the purchase price of the Issie top by using code: ISSIERELEASE10. Don't forget you can also now purchase the pattern in Dutch! Today three more lovely ladies are sharing their Issie tops! Today I am excited to introduce you to four wonderful sewers who are sharing their makes. Today the Issie top tour takes us to Belgium, Switzerland and France!! I love that I can connect with women all over the world through my obsession passion for sewing. Firstly is Isa from Beletoile. Isa is a lovely Belgian lady who lives in Belgium and loves to sew for her two daughters. She has sewn up a couple of my patterns now and always does a wonderful job. She takes beautiful flatlay photos of the outfits she sews for her daughters on Instagram and always manages to style things so beautifully! Look a this wonderful Issie top she made (above) that she cleverly sewed in ombre tones of teale and mint. This little outfit is for her baby daughter Nova. Secondly is Marjolein from Flaflinko! Marjolein also lives in Belgium. I first discovered Marjolein earlier this year on Instagram. She sews for her three children (two sons and a daughter) and has amazing style. Marjolein helped me a lot with the Cosmo dress pattern and is a great supporter of mine which I really appreciate! She used some gorgeous See you at six fabric for this (her third) Issie top. Follow Marjolein's IG account HERE. Thirdly is Eveline from Froleintilia. This is the first time I have had Eveline along on a pattern tour and I discovered her also on Instagram a few months ago. This Zadie dress was the first of her creations that really caught my eye! Eveline lives in beautiful Switzerland and has made some gorgeous Issie tops for her pretty daughter! Make sure to follow Eveline on IG too....her account is lovely! Lastly is Ariane! Ariane lives on the French coast and this is also the first time she has been with me on a pattern tour. Ariane also has a lovely IG page you can see here. She loves to sew for her two daughters as well herself when she has spare time from being a full time teacher. And guess what? Ariane has been so kind to offer to translate the Issie top into French!!! The French translation will be ready in just a few days! 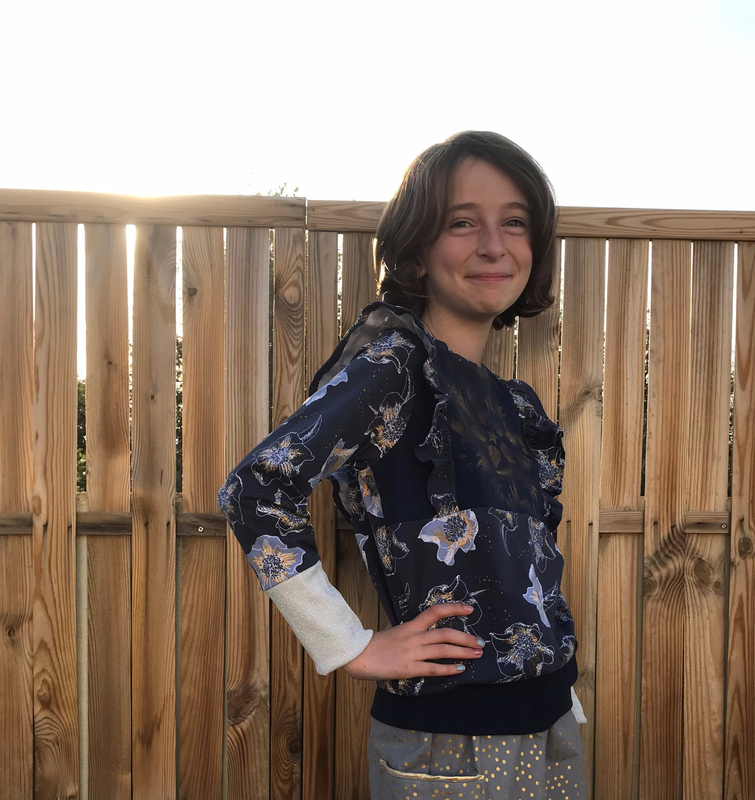 Ariane sewed a few Issie tops during testing and I was very grateful for her helpful feedback! She also has lovely things to share on her IG account HERE. Thank you so much Isa, Marjolein, Eveline and Ariane. Your Issies are all wonderful! !